Kroth Stonegrinder and and his squire Lanseril Snowmantle have traveled to the mouth of the Dragansruth River with the aid of a Lenfald guide. Kroth is attempting to bring some water from the mouth of the river to his Lord. Lord Aldolphus (the Lord of Havenhill) believes fire from which the water springs with imbue the water with the power to super-heat the drinker and cure them of any illness. Lord Aldolphus wants to use the water to cure the on-going illness that has been ailing his wife for the last several months. More photos can be found on Flickr including a few close ups. The rock work is pretty good, though I don't care for the exposed hollow studs on a few of the inverted slopes. So, the water is coming from some sort of underground geyser/volcano? Very interesting. Looking forward to seeing the conclusion! 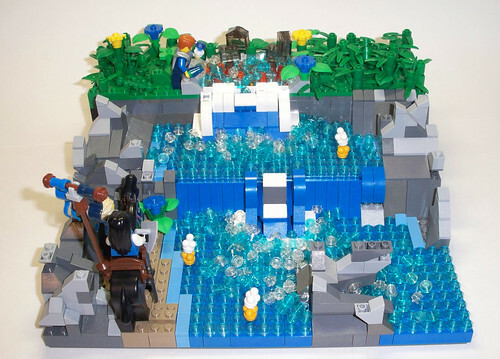 Your A1 build was posted on 5/30, so technically you can post your final apprentice MOC this month, if you feel like you can crank out another quality entry that quickly. Remember, no rush on these, as you only get to do them once! I just realized that I had not replied to your question. You are correct, scientifically, there is a thin spot in the Earth crust resulting in the water being heated. The characters in the MOC believing that the water will have some potential healing properties. Historically is was a common belief that if you had a cold you needed to raise your body temperature and the reverse when you had a fever. This is the origin of the old wives tale "Feed a cold and starve a fever." If this going to be that simple or if there will need to be some other heroic twist in the story, you will just have to wait. Thank you for your interest and trying to uncover the mystery that I am trying to weave into the builds. I sign when I see those beautiful rocks you make. I just can't seem to get the hang of it . Anyway the water you made is wonderful, plus the story is interesting as well.